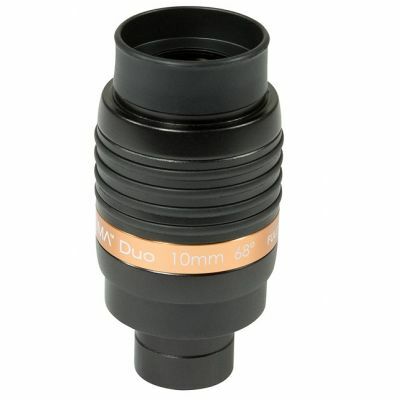 Ultima Duo’s anodized aluminum body allows it to fit both 1.25 inch and 2 inch focusers, so you can use it with almost any telescope with no extra adapters required. A compact body style makes Ultima Duo an excellent choice for use with binoviewers. The rubber grip rings provide good ergonomics so you can hold onto your eyepiece, even while wearing gloves. The aluminum barrel is threaded to accept 1.25 inch eyepiece filters and has a safety recess to prevent it from slipping out of the focuser. Each Ultima Duo eyepiece includes cover caps and a protective carry pouch.